If you grab a hold of a copy of Stephen King’s Under The Dome, you’d be let off for thinking it was a doorstop. King’s mammoth tome, first published in 2009, has been in development for the last few years. CBS are now running full steam ahead on the series which has filmed a roomy 13-episode run. To tantalise you in preparation for its arrival, a trailer has arrived! Check it out below. The series is based in the small town of Chester’s Mill, Maine. One day its residents find themselves cut off from the rest of the world by an invisible force field. Nil points for guessing the shape of the invisible barrier. Panic spreads as the townsfolk realise they cannot escape and can’t penetrate the field. Lucky for us, this is based on a King novel so we’ll get a glut of good vs. evil shenanigans as people go utterly bonkers when the booze dries up/smokes run out/Marmite is all eaten, etc. A band of reasonable, level-headed sorts group together in an attempt to find out the cause of the dome, and how to get rid of it. So far, so King. Like we said, the book is gargantuan and slowly fills in character details through its leisurely 1074 pages. With Steven Spielberg’s Amblin Entertainment behind it, don’t expect the NSFW content to make it onscreen. We’d love to see a King TV adaptation geared towards a more adult audience, but, beggars can’t be choosers. The series was developed by Brian K. Vaughan, a Lost writer and producer who also made his name in the world of comic book writing. Contributing to Marvel and Dark Horse, he’s a man who knows his stuff. The Girl With The Dragon Tattoo director Niels Arden Oplev helmed the pilot and King will also serve as an executive producer for the show. 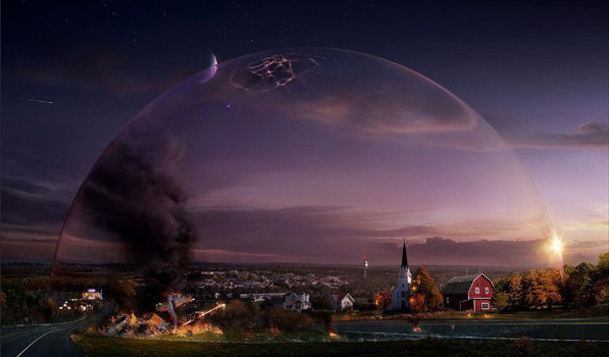 Under The Dome premieres on June 24th on CBS.